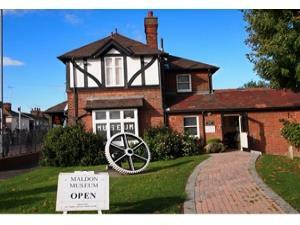 Social history museum of Maldon and District situated in the Park Keeper's house at the popular Promenade Park. Parking for cars, coaches and disabled parking are to be found 200m from Museum building as are toilet facilities. A bus stop for the 31 service from Chelmsford-Maldon is 100m from building. Open bank holiday Mondays from 11am to 5pm. Latest admission 4.30pm. Group visits are always organised outside those advertised times. £2 adult, £0.5 child 5-16years. Group rate £25 for 1-25 persons, by arrangement only.